The Siesta Key Condo Council will hold its annual membership meeting on Dec 4, 3 pm at the Siesta Key Chapel, 4615 Gleason Ave. The topics this year are Save Our Siesta Sand 2 Update, Holiday Decoration Contest, Siesta Key Sheriff’s Office Report and Benderson Siesta Promenade Status. The main speaker is Mike Angers from Brown and Brown Insurance Agency. Angers will be discussing Hurricane Michael and Insurance, lessons to be learned, along with a Q & A session with the audience, future membership meetings-Jan 15 and Feb 19, 2019. In this month’s edition discount coupons are being offered by The Oaks and Station 400. Station 400 is offering $5 off your next visit and The Oaks is offering a FREE appetizer with a $20 purchase. Both ads are located on page 14. With a 12th Judicial Circuit Court judge having denied her motion for a rehearing of the case, Siesta resident Lourdes Ramirez has appealed the judge’s Aug. 10 dismissal of her civil complaint against Robert Waechter, also of Siesta Key. On Sept. 24, Circuit Judge Andrea McHugh offered little in the way of information in her order to explain her decision to deny the rehearing. In the meantime, after an Oct. 30 hearing, McHugh ruled that Waechter is entitled to attorneys’ fees, in accord with a motion filed by his attorney, Morgan Bentley of the Bentley & Bruning firm in Sarasota. Based on a timeline reflecting Ramirez’s refusal to settle the case in September 2017 for $500, Bentley originally sought $34,370.92 in fees and costs of $5,300.14. McHugh noted in her Oct. 30 order that the parties were to advise the court within five days about whether they would pursue mediation. On Nov. 6, Ramirez and Waechter did file a joint notice “to have the entire case mediated before any more proceedings are had on Defendants’ Motion for Attorneys Fees,” pursuant to McHugh’s order. Ramirez filed her complaint against Waechter and his business, RWR Installations, in March 2015. It points out that he bought a prepaid credit card in 2012, through which he made contributions, in her name, to Democratic candidates. Ramirez is a Republican. After she received a thank-you note from one of the candidates, she went to the Sarasota County Sheriff’s Office, seeking an investigation of apparent identity theft. Waechter ultimately admitted to purchasing the card and pleaded guilty in 2013 to a misdemeanor charge in the criminal case. He also paid tens of thousands of dollars in fines. Nonetheless, Ramirez argued in her civil complaint that his actions damaged her 2014 campaign for County Commission. She lost the District 4 Republican Primary that year to Alan Maio of Nokomis, who went on to win in the General Election. In regard to Ramirez’s appeal: The Second District Court of Appeal issued a formal acknowledgement of the case on Oct. 23. The $300 filing fee for the appeal was noted in a separate Oct. 23 document. Ramirez’s attorney is Jose A. Gutierrez of the Cosio Law Group in Coral Gables. On November 21 The UPS Store located at 221 Beach Road on the north end of the Key closed its doors. IF you need things shipped, Davidson’s Drugs has a Post Office located in each of its stores on the Key. Davidson’s Post Office will be able to handle all your holiday shipping needs. If you are looking to use a UPS Store and live on the northern part of Siesta Key, the nearest store is just off the north bridge located at 15 Paradise Plaza off of Osprey Ave. and Versailles. You can contact them at 941-957-1776. During the Nov. 8 Siesta Key Association meeting, members were able to meet Sgt. Paul Cernansky, the new leader of the Sarasota County Sheriff’s Office substation, and a new lieutenant overseeing island operations, Lt. John Varley. Long-time Siesta Deputy Chris McGregor introduced the men, noting that the former substation leader, Jason Mruczek, had been promoted to lieutenant and reassigned to the Animal Services division on Bee Ridge Road, east of Interstate 75. “They are great guys,” McGregor said of Cernansky and Varley. McGregor also pointed out that Cernansky would continue to spend some of his time as a member of the Mounted Patrol. “You’ll see more of a presence out here,” Cernansky added of the Mounted Patrol, which often works on the Key during spring break. “Our goal is really prevention of crimes and keeping the quality of life the way it is,” he said. Cernansky and Varley both invited the SKA members to stop and chat with them when they see the men on the island. However, Cernansky did caution everyone, with a laugh, “I can hold you down for a long time” in a conversation. They had most recently worked together in the Sheriff’s Office Tactical Unit, Varley added. Come enjoy the 3rd Annual Siesta Beach Seafood & Music Festival, a marvelous event blending fresh seafood, stellar live musical performances and a marketplace of arts, crafts and select fine products. The event starts Friday night November 30 and continues December 1-2, with hours Friday night from 4pm – 9pm and both Saturday and Sunday from 11 am – 6 pm. General admission is $5, children 12 and under Free, Siesta Beach, 948 Beach Rd. Island House Tap and Grill recently opened in the space vacated by Senor Siesta located at 5110 Ocean Blvd next to Café Gabbian. The owner of the restaurant Troy Jenkins reported to Siesta Sand, the Grand Opening is targeted for the second week of December. The Siesta Key Association (SKA) is composed of citizens, who have a vested interest in preserving and protecting the quality of life offered by our beautiful Island. A Board of volunteer Directors, all of whom live or own property on Siesta Key, manages this non-profit Association. The Board of Directors has a rich tradition of representing and pro-actively lobbying for the rights of the citizens of Siesta Key dating back 70 years. In today’s environment of growth, it is becoming ever more critical to have an active body that represents the interest of all residential property owners on Siesta Key. On Oct. 26, the Siesta Key Chamber of Commerce offered thanks to St. Boniface Episcopal Church in an email blast. The church provided help to working families whose incomes were affected by red tide, the email pointed out. “The need was real because St. Boniface distributed $7,500 in aid to folks who contacted [church leaders],” the email said. Unfortunately, the church exhausted its funds for that purpose, the email added, so it had to end the aid. “Thank you, St. Boniface, for supporting the Siesta Key community!” the email concluded. When SKA President Gene Kusekoski asked at the end of the November meeting whether members had any questions, one woman spoke up about the lights being inoperative at the crosswalk near the Midnight Cove II condominium complex, which is located at 6327 Midnight Pass Road. Kusekoski acknowledged that a plastic bag and tape were over the controls for that crosswalk. “It’s a dangerous situation,” the woman pointed out. Kusekoski told her he would contact the Florida Department of Transportation (FDOT), which installed the Midnight Pass crosswalks in late 2012. He was a bit amused, he added, to see a bag over the head of the switching mechanism. “At first, we thought it was Halloween mischief,” the woman responded. Subsequently, Kusekoski learned that even though FDOT installed the crosswalks, the maintenance of the equipment is a responsibility of Sarasota County. Robert Fakhri, manager of the Traffic Engineering and Operations Division for the county, reported that staff had put in a work order to repair the flashers, as the unit that controlled them had died. FDOT had contacted his office, he said, after hearing from Kusekoski. “We’re waiting for the equipment to come,” said Fakhri on Nov. 14. “We’re lucky,” he added, as it was expected to come in quickly. If all went as planned, he said, the repairs were to be completed on Nov. 16. During a County Commission public hearing in late October regarding a change in the Tourist Development Tax ordinance to provide funding for repairs to Ed Smith Stadium, two Siesta Key property owners were among the 11 speakers who addressed the board. Visit Sarasota County (VSC), the county’s tourism agency, had encouraged its members to fight a county staff proposal to divert money from VSC’s promotional budget in the 2020 and 2022 fiscal years to cover the work at the stadium. One of the Siesta speakers was Paul Parr, who fought back tears as he explained that he was about to lose his rental business on the Key because of red tide’s detrimental effects on tourism. Earlier, Maio had referred to the “hundreds if not a thousand emails” he and his fellow board members had received from people in the hospitality industry in the county. After the Oct. 23 hearing, Parr sent an email to Maio, on which Parr copied the other board members — and Siesta Sand. “I would be less than honest if I did not let you know how disappointed I was with today’s meeting,” Parr began. “My head was spinning as I walked out and drove to my almost empty Siesta Sunset Royale building,” he continued. Maio ended up winning the election for the District 4 seat. The other Siesta speaker was Dr. Gary Kompothecras, best known for his 1-800-ASK-GARY medical and legal referral service advertising. Kompothecras has lived on Siesta since 1983, he told the commissioners. “I’ve never seen any such devastation in my life,” he added of red tide’s effects. “Go to [the] restaurants,” he continued. “No one’s there. The waitresses are starving; they can’t make their rent. … This is worse than a hurricane. … [Guests are] cancelling in January,” he pointed out. He suggested the Baltimore Orioles, which conduct Spring Training at Ed Smith Stadium, add a surcharge of $2 to $3 per ticket to raise the revenue for the facilities repairs. Nicole Rissler, director of the county’s Parks, Recreation and Natural Resources Department, explained at the outset of the hearing that a Memorandum of Understanding between the county and the Orioles requires the county to ensure the stadium conforms to Major League Baseball standards. 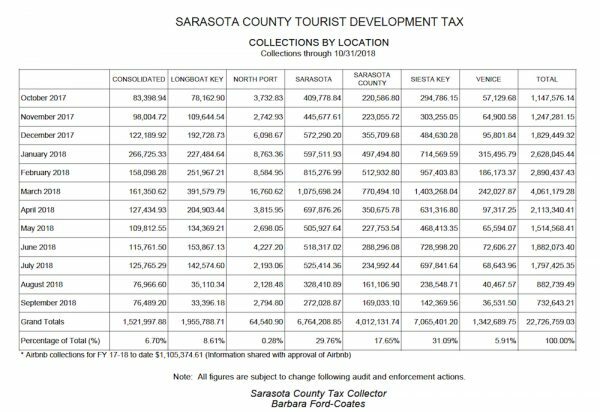 Although audits could lead to a change in the numbers down the road, Siesta Key property owners and accommodations once more appear to have collected more Sarasota County Tourist Development Tax (TDT) revenue during the fiscal year than those in any other county location. Figures through Sept. 30 — the last day of the 2018 fiscal year — show Siesta Key with 31.09% of the “bed tax” revenue, followed by entities in the city of Sarasota, with 29.76%. The 5% bed tax is charged on rental of accommodations for six months or less time. Siesta has come out on top for the past several years, according to the records of the Sarasota County Tax Collector’s Office. During the Nov. 8 SKA meeting, Deputy Chris McGregor said he had no crime trends to report. Between the time of year — when fewer people normally visit the Key — and the red tide news keeping visitors away, he said, things had been slow. When McGregor asked whether any SKA members had questions, one woman reported that, during the summer, she found a gas card at one of the Siesta Beach concessions, which she turned over to an employee there. The person had promised to give it to an officer, the woman added, asking whether she had acted appropriately. He asked the woman if the card had a name on it. When she replied that it did not, McGregor responded that, occasionally, after people “burn through a gift card,” they will just leave it at the last place they used it. Cernansky suggested, laughingly, that “burning” might not have been the best choice of word, so McGregor corrected himself, also with a laugh. What he was referring to, McGregor said, were situations when people had “used all of the monetary value” of the cards. On Monday, Nov. 12, the Siesta Key Association (SKA) observed its 70th birthday. News about the celebration drew a big round of applause during the November SKA meeting. cottages but limited other development. Yet, residents could envision big changes in the future, she continued, and they wanted to ensure that new construction would take place in an orderly fashion. A group of Siesta residents went to the Legislature in Tallahassee, Luckner explained, and petitioned for what was called “an enabling act,” so they would have the right to create their own zoning code. “That was done not without great difficulty,” she added. When they had obtained the necessary number of signatures, they needed, Luckner pointed out, they were able to win the Legislature’s support for the zoning code. Then, in 1954, she continued, the Sarasota County Commission “followed what we did,” working to create a countywide zoning code. Among other SKA achievements, she continued, were the installation of the first fire hydrants on Siesta, which reduced the expense of the island’s fire station, because of the change in classification for the service as a result of the presence of the hydrants. “We also led the way for the north bridge to remain two-lane. People wanted to make it four lanes,” Luckner pointed out. Residents were very happy to see it stay a two-lane structure, she said. Yet another initiative of the SKA was obtaining the support of the homeowners association in the Coconut community along the beach on the north end of the island, so improvements could be made to Ocean Boulevard. The homeowners association was willing to give up “a little bit” of its property for the roadwork, she added. The SKA also petitioned the Florida Department of Transportation (FDOT) for the first crosswalks on the Key, and it worked with FDOT representatives again in 2012 to push for the installation of the crosswalks on Midnight Pass Road between the Beach Road and Stickney Point Road intersections. Thanks to the SKA’s work, she continued, the County Commission approved regulations to set a maximum density for residential development on the island. Additionally, after two 12-story condominium towers were completed, the nonprofit pushed for a height limitation of 45 feet for any other multifamily residential structures. That is why Siesta Key does not look like Fort Lauderdale, she pointed out. Moreover, SKA members “always have been proponents of the environment here,” Luckner said. For example, at one time, septic tanks were the norm on the island. The SKA was among the groups that worked to establish the Siesta Key Utility Authority (SKUA), she said, which handled water and sewer hookups for the island. “It was wonderful [drinking] water,” she said of the SKUA service. Yet another big initiative of the SKA, Luckner continued, was the organization of a subsidiary, Save Our Sand, in 1992. It fought the proposal of the City of Venice to dredge Big Sarasota Pass for a beach renourishment project and won in federal court. 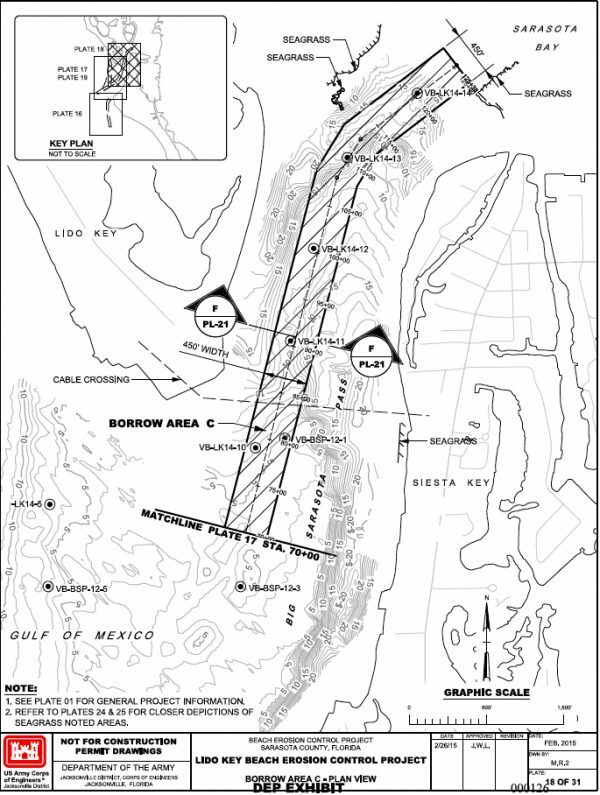 The U.S. Army Corps of Engineers (USACE) had obtained a permit for the project, Luckner explained, but the permit was withdrawn as a result of the court decision. “The Siesta Key Association exists because people live here,” President Gene Kusekoski told the approximately 60 SKA members at the Nov. 8 meeting. For example, he said, when he and his wife were discussing retirement, they did not want to be in a community of transients. They wanted neighbors. The SKA continues to work for a balance between what visitors need and the needs and desires of the island’s residents, he added. The Key “is not a drive over the bridge to Disneyland” type of place, Kusekoski pointed out. Watch out for those pipes! With the Siesta Key Association (SKA) still pursuing a remedy in the 12th Judicial Circuit Court and Save Our Siesta Sand 2 (SOSS2) preparing to take action in federal court, a leader of the SKA’s Environmental Committee has told members of that nonprofit he is doubtful the City of Sarasota will see its long-range renourishment project getting underway on South Lido Key at any time next year. Both of the Siesta-based organizations remain committed to preventing the dredging of Big Sarasota Pass for the sand to renourish about 1.6 miles of the critically eroded beach on South Lido. During the remarks Robert Luckner, the SKA Environmental Committee leader, made to members of that nonprofit on Nov. 8, he also talked of new issues that have popped up that he believes must be resolved before any dredging could proceed. In the research he and his wife, Catherine — the SKA’s vice president — have pursued on the proposal of the U.S. Army Corps of Engineers (USACE) and the City of Sarasota to renourish South Lido, he has found something curious, he said. A freshwater pipeline that is 16 inches in diameter runs across the pass, he reported; it was laid in 2000, right next to the line it replaced. On Oct. 1, Robert Luckner emailed Sarasota City Engineer Alexandrea DavisShaw information about his discovery, including a city map to illustrate his concern. The “potable water line owned by the City … crosses from … Ted Sperling Park [on South Lido] to Siesta Key,” he noted. There, it connects to the water system for Bay Island, he continued, which is the northern part of Siesta and within the city limits. Luckner then posed several questions to DavisShaw. Among them, he asked how deep the newer water pipeline is and what steps the city, the USACE and their contractors would take to avoid it. He also inquired about the type of cable he had found on the map and what measures would be taken to avoid it, if the pass is dredged. The response he received from the city, he told SKA members, was that no answer could be provided about the depth of the water pipeline because of “Homeland Security” issues. DavisShaw first replied to Luckner via email on Oct. 2, saying she would check with the city’s Utilities staff and get back to him. Last year, when the 12th Judicial Circuit Court allowed the Lido Key Residents Association (LKRA) to intervene in the Siesta Key Association’s lawsuit against the City of Sarasota, to try to stop the dredging of Big Pass, the firm representing the LKRA was located in Bradenton. Earlier this year, however, an investigation found that Lewis, Longman & Walker had a new address — in St. Petersburg. The list of attorneys does not mention anyone in Bradenton, according to the research of the firm’s current website. Apparently, we were not the only one surprised by the change of location. With the intensification of focus on red tide and its causes, SKA Vice President Catherine Luckner reported to members on Nov. 8 that members of the Barrier Islands League have begun a new collaboration to determine how best they might be able to help. She reminded the audience that the League was very active several years ago in working on a Post-Disaster Response Plan (PDRP) that provides details about how property owners would be able rebuild on the barrier islands in the aftermath of a catastrophe such as a major hurricane strike. The League members, along with the SKA, were the associations on North Manasota Key, Manasota Key and Casey Key. Laird Wreford, the county’s coastal resources manager, facilitated the work of the Barrier Islands League on the plan, Luckner continued. “It was quite a good product,” she added of the group’s efforts. “We’ve been meeting for the last three months,” she continued, referring to the red tide issues. Part of the focus has been on pinpointing state and local measures the group should seek to reduce the red tide bloom that has lingered off the west coast of Florida since October 2017. The Nov. 14 report on red tide released by the Florida Fish and Wildlife Conservation Commission (FWC) said that the red tide algae, Karenia brevis, “was observed in samples from and/or offshore of Pinellas to Monroe counties.” High concentrations, it noted — those exceeding 1 million cells per liter — were detected in waters in or offshore of Sarasota, Pinellas, Charlotte and Lee counties. Fish kills and respiratory irritation also were reported in Sarasota County, the report said. A big focus of the group, she indicated, is the desire to talk at length with legislators about implementing state inspection requirements for septic tanks, since such a law failed to be implemented several years ago. “Manasota Key is still completely on septic,” Luckner pointed out. Because of the “big beautiful trees” on that island, she said, residents have been reluctant to pursue installation of a sanitary sewer system, as that would necessitate removing trees. She added, “Our next step is to ask the North Lido Residents Association” and an organization of residents on Longboat Key to join the League. All of the organizations, she pointed out, are dealing with red tide. Previous Previous post: Who will buy the Bank of America building on South Siesta Key?